WASHINGTON, DC, March 13, 2012 (ENS) – The U.S. Environmental Protection Agency today added nine new hazardous waste sites to the National Priorities List of Superfund sites, and is proposing to include 10 additional sites. Superfund is the federal program that investigates and cleans up the most complex, uncontrolled or abandoned hazardous waste sites in the country that pose risks to people’s health and the environment. “Protecting human health and the environment and restoring contaminated properties to environmental and economic vitality are EPA priorities,” said Mathy Stanislaus, assistant administrator for EPA’s Office of Solid Waste and Emergency Response. “When property is cleaned up and revitalized, the reuse may result in new income to the community in the form of taxes, jobs to local residents, increases to the values of properties nearby cleaned up sites, or it may provide recreational or other services to make the community a better place to live,” said Stanislaus. Since 1983, 1,661 sites have been placed on the Superfund List. Of these, 359 sites have been cleaned up, resulting in 1,302 sites currently on the list, including the nine sites added today. There are 62 proposed sites, including the 10 announced today, awaiting final agency action. Contaminants found at the sites include arsenic, benzene, cadmium, chromium, copper, creosote, dichloroethene (DCE), lead, mercury, polynuclear aromatic hydrocarbons (PAHs), polychlorinated biphenyls (PCBs), tetrachloroethylene (PCE), pentachlorophenol (PCP), trichloroethane (TCA), trichloroethylene (TCE), toluene, uranium and zinc. With all Superfund sites, EPA works to identify companies or people responsible for the contamination at a site, and require them to conduct or pay for the cleanup. For the newly listed sites without viable potentially responsible parties, EPA will investigate the full extent of the contamination before starting major cleanup at the site. So, it may be several years before funding is required to clean up these sites. Continental Cleaners, a former dry cleaners in Miami, Florida: Numerous studies have documented tetrachloroethene, a common dry cleaning solvent and its breakdown products in the soil and ground water at the site, and it is likely to have migrated offsite. The aquifer beneath the site is the sole source of municipal drinking water for southeast Florida. 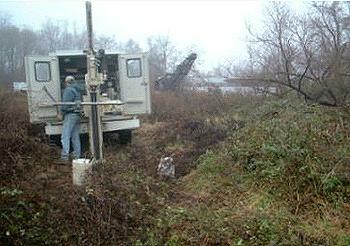 Sauer Dump, an inactive dump in the Dundalk area of Baltimore, Maryland: The site is bordered by a cove of the Back River, a tributary to the Chesapeake Bay, tidal wetlands to the south, and non-tidal wetland areas along three other borders. During dump operations from the 1960s through the 1980s, hazardous substances were improperly stored and disposed of on the property. Concentrations of semivolatile organic compounds, metals, polychlorinated biphenyls and pesticides are present at elevated levels in the soil and sediment. Compass Plaza Well TC, a contaminated ground water plume in Rogersville, Missouri: Ground water contaminated with trichloroethene has polluted domestic and irrigation wells. Chemfax, Inc., a former manufacturer of synthetic resins and waxes in Gulfport, Mississippi: Company now bankrupt and site inactive. Contamination of air, soils, ground water, surface water and sediment with benzene, toluene, ethylbenzene, xylenes and polynuclear aromatic hydrocarbons. Southeastern Wood Preserving, a former wood treating operation in Canton, Mississippi: Between 1928 and 1979 several companies conducted wood treating operations at the site. Soil, sediment and ground water are contaminated with creosote and related compounds. Free-phase creosote is entering Batchelor Creek along a stretch of 700 feet and affecting sediment nearly a mile downstream. Ground water sampling found 17 chemicals at levels above state and federal standards. CTS of Asheville, Inc., a former electronics components manufacturer in Asheville, North Carolina: Trichloroethene was used in processes at the facility and was released through drains in the building. There is subsurface soil contamination below the building and more than 105 private drinking water wells are at risk within a mile of the site. The EPA has identified seven private drinking water supplies contaminated with TCE, and has provided clean drinking water to these residents. Eighteenmile Creek, a contaminated creek in Niagara County, New York: Long history of industrial use dating back to the 19th century has left numerous industrial facilities and hazardous waste sites. Creek sediments are contaminated with pollutants, including mercury, lead, copper, pesticides/insecticides; PCBs, dioxins, and furans. Eighteenmile Creek is surrounded by six residential townships, croplands and orchards. Several wetlands are adjacent to contaminated portions of the creek, and Fisherman’s Park is a major public fishing area. 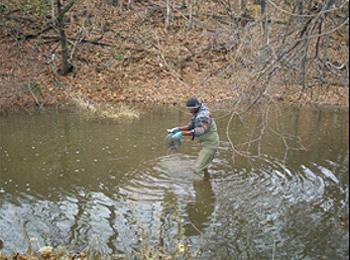 The contaminated sediments contribute to a degradation of	fish and wildlife populations, the presence of fish tumors, and the prevalence of bird and animal deformities or reproductive problems. The reach of the creek between Burt Dam and Lake Ontario is classified an Area of Concern by the Great Lakes National Program Office, due to its natural resources value within the Lake Ontario watershed. Metro Container Corporation, a former drum recycler in Trainer, Pennsylvania: 20 miles south of Philadelphia, in a mixed industrial/commercial/residential area along the Delaware River. At the close of the 19th century, the site was occupied by the Delaware Oil Works. From 1920 until 1959, the Stauffer Chemical Company, Inc. operated a chemical manufacturing plant there. Subsurface soils and ground water are contaminated at the site and at nearby properties. This contamination has been traced to the tidal flats adjacent to the Delaware River. The site is contaminated with polychlorinated biphenyls, volatile organic compounds, polyaromatic hydrocarbons and inorganics. Corozal Well, a contaminated ground water plume in Corozal, Puerto Rico: Ground water contamination in the Comunidad Santana well was discovered in November 2010 by the Puerto Rico Aqueduct and Sewer Authority. Tetrachloroethene, an industrial solvent, was found at concentrations above the EPA’s Safe Drinking Water Act Maximum Contaminant Level. The contamination affects the Comunidad Santana well, the sole source of drinking water for a rural community of more than 200 people. EPA is withdrawing its earlier proposal to add the Arnold Engineering Development Center site in Coffee and Franklin Counties, Tennessee to the Superfund List. This site is being addressed under the Resource Conservation and Recovery Act program, and the EPA says cleanup is progressing successfully, the migration of contaminated ground water is under control and measures have been taken that are protective of human health.